Now this is deeply satisfying. I have been wanting one of these little beauties for a while. 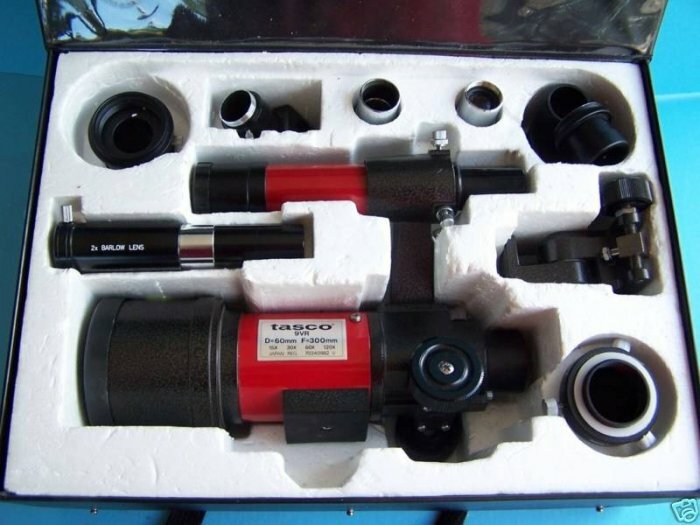 This is the 9VR, a 60mm f/5 achromatic refractor sold by Tasco in the 1980s, but manufactured by Vixen in Japan. 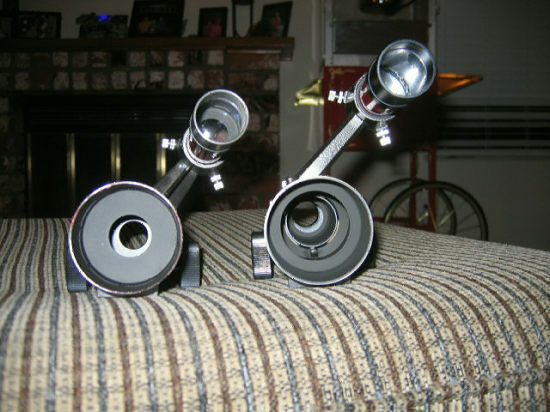 These Vixen scopes came out under several brands, including Celestron. It’s basically a “Short Tube 60”, and the spiritual and possibly the actual ancestor of the Short Tube 80s that started taking the world by storm not long after. In fact, there was also a Vixen-made 10VR that basically was the original Short Tube 80, so that evolutionary line may have been real, and direct. 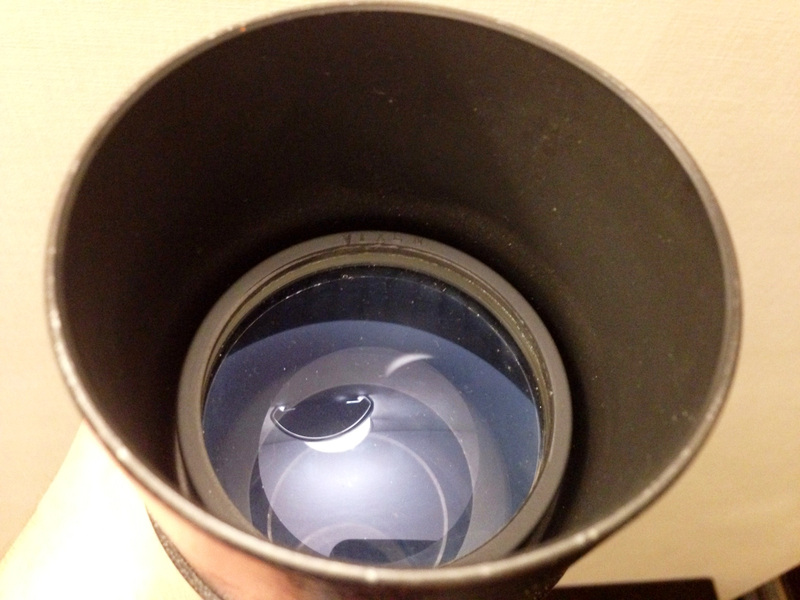 If you can’t already make it out, click through to see the embossed VIXEN on the objective lens cell. It is a truly tiny scope. At 9.5 inches, a little longer than the PICO-6, and maybe a smidge heavier. I should get them together for a side-by-side comparo. So how does it work? Optically and mechanically it is very sweet. This is my first experience with Japanese-made gear, and it does not disappoint. I haven’t done extensive optical testing, but the scope shows plenty of detail on Jupiter despite having only 60mm of aperture and 300mm of focal length to work with. It’s fast at f/5, but chromatic aberration is somewhere between “unobjectionable” and “is it even there?” It is, but you really have to look for it; the image is surprisingly clean. The bottom of the scope, showing the tripod mounting block and the loooong focuser drawtube, with a helical-cut rack. The focuser is so smooth it’s uncanny. 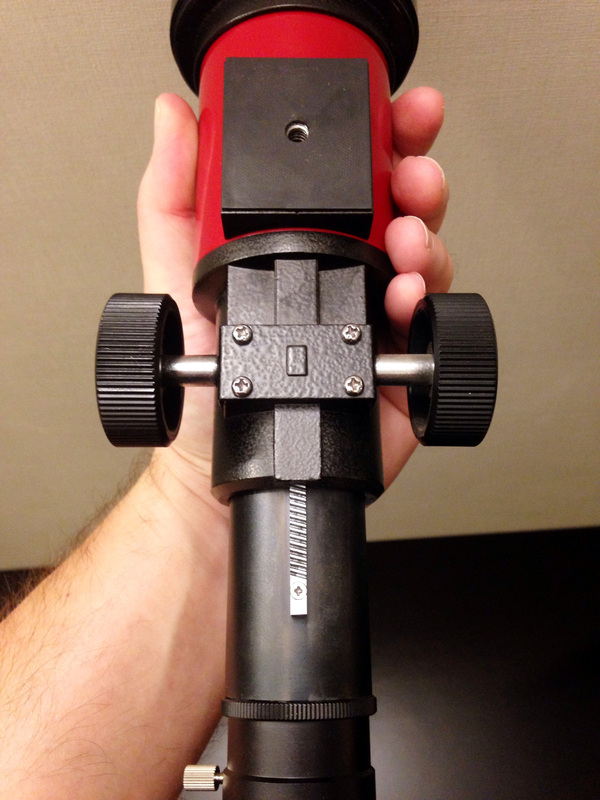 I’ve never had a problem with the rack-and-pinion focusers on the mostly low-end scopes I own, but I did not know what I was missing because I did not know that a focuser could be this smooth. The scope came in a little suitcase-style case with a big block of styrofoam with cutouts for the OTA and a horde of accessories. 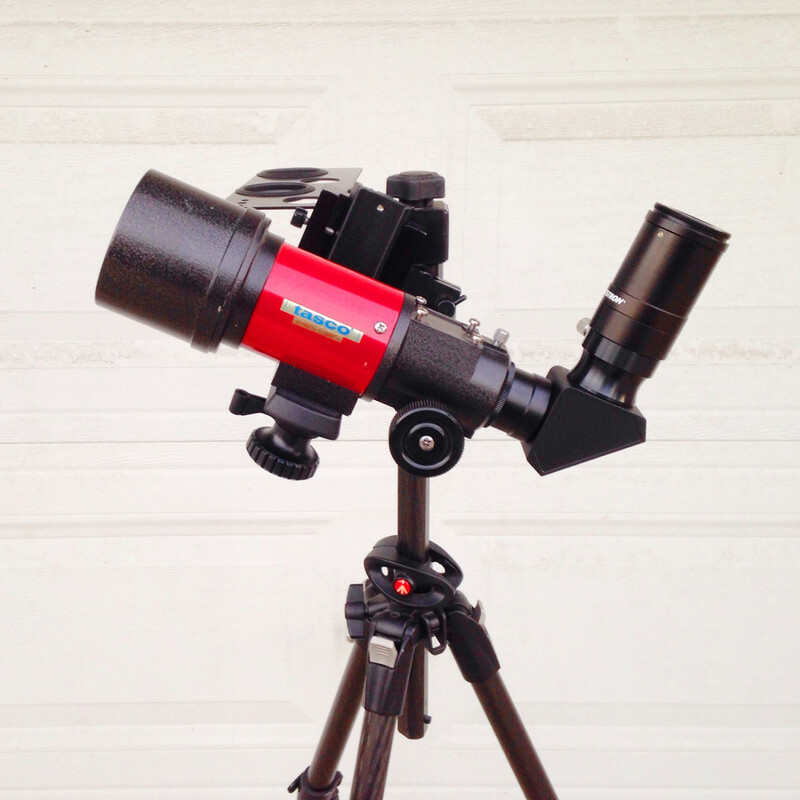 I haven’t gotten around to taking a glamour shot of my own scope in its case, so this one’s lifted from the web. One of those accessories is a slow-motion alt-az adapter, visible in the middle on the right side. I’ve owned and used similar units by Orion and Celestron and they were fine, but again, this Vixen adapter is so smooth it makes the others look downright crude by comparison. If you want one of these, it’s like most vintage gear: you can (1) just pay more now, (2) be patient, or (3) be lucky. You can almost always find someone unloading one for $150 or so, but if you wait and keep an eye on Craigslist and Shop Goodwill you can sometimes find one for half that. I have wanted one of these for a while but never enough to get dedicated about the search. Then in around the end of February (yes, I’m getting this posted late) I saw a classified ad on CN for an ‘astro garage sale’ with something like two dozen items on sale. There were no photos of the ’60mm Vixen spotting scope’ but I had a hunch so I wrote to the seller to inquire. He sent some pictures, I sent some money, and here we are. Stopping down the objectives cuts down their chromatic, spherical, and other aberrations, which are apparently much more pronounced than in their Vixen predecessors. I’ve read of people taking apart the scopes to remove these aperture masks, but at least some folks have found the results yucky enough that they put the masks back in. The 99VR and 999VR have a reputation for being fairly sharp as daytime spotters, where light-gathering is less important, but I have to imagine that they suffer quite a bit at night with only 1/4 the light grasp of the 9VR. The 99VR and 999VR are odd beasts to me. On one hand, they shipped with very desirable accessories, including a nifty tabletop tripod with the 999VR. But the pricing on them seems to me to be all wrong – a lot of people online are offering them for almost as much as you’d expect to pay for a 9VR. That’s a lot of dough for what is basically a glorified 30mm finder wrapped up in a lot more metal and glass than is actually needed. Maybe I’m off here and people are simply charging what the market will bear. I suspect that at least a few buyers haven’t done their homework, though, and get a 99VR or 999VR when what they really wanted was a 9VR. 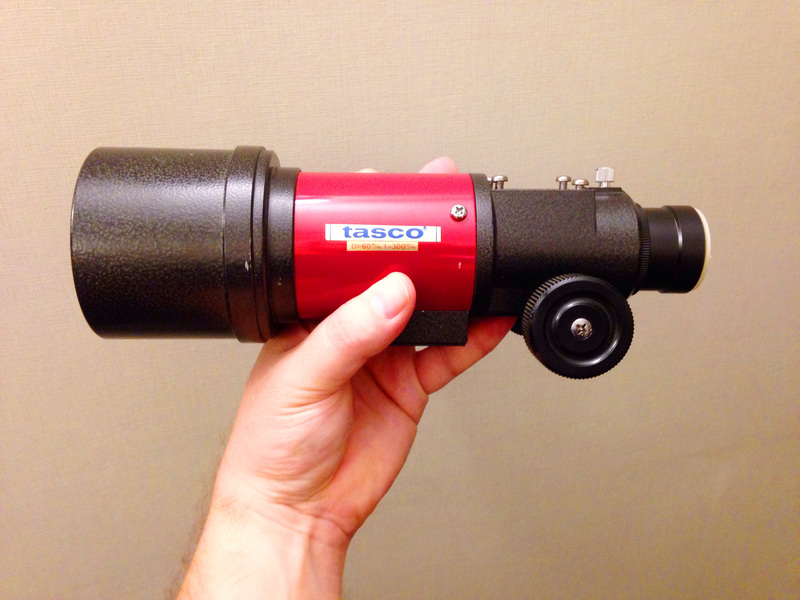 I guess it just rubs me the wrong way that Tasco knowingly sold a whole telescope that was stopped down to half of the apparent aperture. Another comparo, again with the 99VR on the left and the 9VR on the right, also courtesy of CN user Steve_M_M. I don’t know how the timing of all of this relates to the demise of Tasco as a desirable brand, whether the 99VR and 999VR were heralds of the approaching decline or symptoms of advanced rot already in progress. That probably sounds harsh – please take it with a big grain of salt if you own and love a 99VR or 999VR. I’m not slagging off the instruments so much as the designers/marketers that thought 30mm scopes masquerading as popular 60mm scopes were a good idea. And with all of that said, if I ever run across an affordable 999VR I will pounce on it just for the tripod. You can learn more about how the 99VR and 999VR compare to the original 9VR in this CN thread and this one. One other thing to be aware of – the 9VR and both of its successors use 0.965″ eyepieces. If you want to use the standard 1.25″ EPs, you’ve got a couple of options. You can get a hybrid diagonal – 0.965″ in, 1.25″ out – or you can get a 1.25″ adapter that screws into the drawtube. I got one made by Vixen and sold by B&H Photo Video (link). In the above photo, my 9VR is set up for birding with the Celestron 8-24mm zoom, and that is a potent and flexible combination. 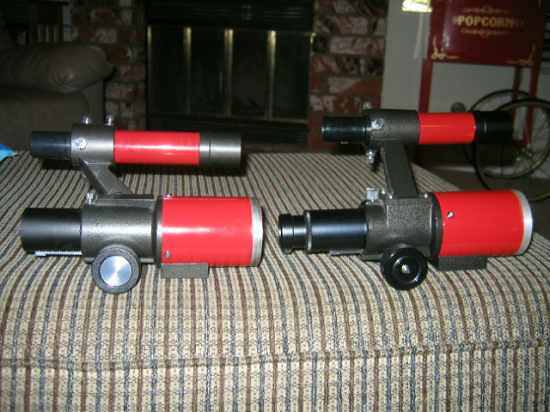 I have not one but two ‘traditional’ 60mm spotting scopes, and they may both be looking for new homes soon. I’m glad this came my way. It’s a cool little scope, amazingly well-built considering that it’s a ‘humble’ 60mm and from the stubby end of the gene pool to boot. I wish that these things were still being made – there seems to be a niche there that is not currently filled by anything under about $400. Beautiful! 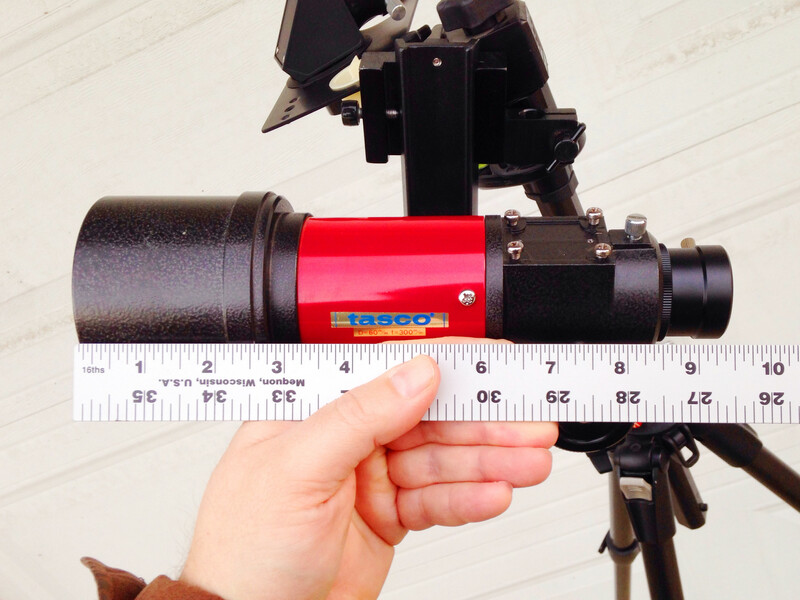 I know you were actively looking for this scope – glad it finally came your way! Great little scope – thanks for the write up. I’ve got one as well – the only issue I have is that I can’t get it to focus with a Barlow in – it’s like the focuser needs a bit more “in” travel. This is with the vixen 1.25 adapter. Have you run into this? Or is this an issue with my scope/Barlow combo? Hi. Could you tell me about the mount that you’re using in these pictures? I can see it’s a Manfrotto tripod, but I’m curious about the head and the eyepiece tray. Thanks. 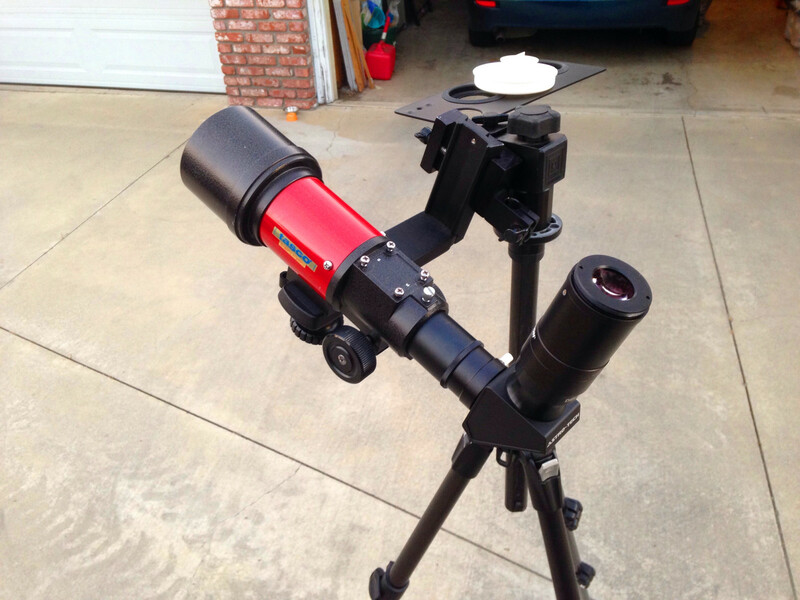 Hi Joel, it’s a DwarfStar mount from Universal Astronomics (link). Totally solid little adjustable-tension alt-az mount. I got it ages ago and it’s one piece of kit I’ll never part with.